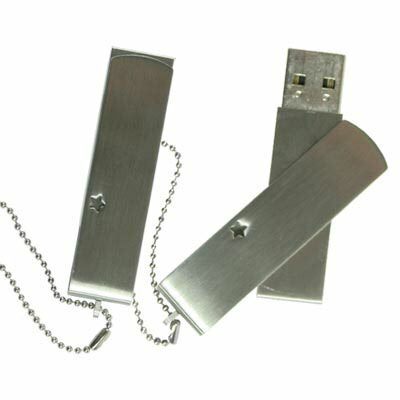 The Swivel Metal is a shiny metal cap-less promotional USB drive. It features a LED indicator and key chain. It also has plenty of room for logo imprinting on front and back, making it an excellent branded giveaway item for your next event or tradeshow. Your brand name or logo will simply gleam off the shiny metallic drive. Paired with data storage, potential customers will find this irresistible. For a promotional product that catches the eye and keeps it there, check out the Swivel Metal. It offers recipients a wide variety of storage capacities using a steel drive body that perfectly sets off any logo printed or engraved there. It has a capless design that utilizes a swivel to protect the port. It is a modern take on a classic memory stick shape. It is highly compatible with most operating systems and utilizes standard transfer speeds, much to the delight of potential customers, who—after receiving this tech goody—will look much more favorably on you than before.